But I love making healthy delicious meals for my family, and you already know I adore photography! So when I took my sweet littles to our local U Pick, I couldn’t resist documenting some of our yummy dinner creations with my trusty ole camera. In case you missed it, here is the blog post from last Thursday when I took my sweet babes to the 710 U Pick in Indiantown, Fl. We picked so many GORGEOUS veggies that day, and they are still beautifully fresh and vibrant after a week. I’m pretty sure my kiddos believed that veggies bloomed fresh from the supermarket shelves before this introduction to where things really come from. To me there is something so special about showing my children the hard work and tender loving care that comes with growing your own food. My (now) 4 year old was amazed at the eggplants and tomatoes. He was so excited to place them in our bag as I told him what we were going to make at home. He actually ate the egg plant parmesan because he remembered how he picked them himself. I also utilized his cheese spreading skills as we made this super yummy dish. I love seeing him proud of himself as he helps me in the kitchen. 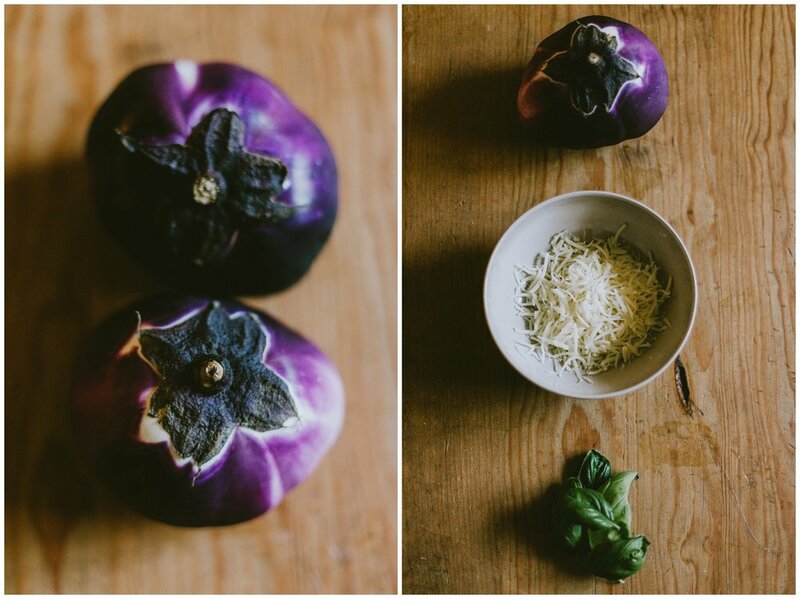 Enjoy the photos below, and check out those gorgeous farm fresh egg plants that we picked! Yum! See recipe below! Heat oven to 400 degrees, coat baking sheet with small amount of olive oil to prevent sticking. Thinly slice eggplant, about 1/4 inc thick. Wisk egg whites and water together, then dip eggplant slices in the mixture. Combine breadcrumbs, ¼ cup of the Parmesan, salt and pepper, then coat eggplant slices. Arrange the eggplant slices onto baking sheet in single layers for about 15-20 minutes or until golden brown. I usually bake mine for about 20 minutes, because I love the extra crunchy and extra golden! Stir basil into tomato sauce. Spread about ½ cup of the sauce in the bottom of the prepared baking dish. Arrange half of the eggplant slices over the sauce, overlapping slightly. Spoon 1 cup of the remaining sauce over the eggplant and sprinkle with half of the mozzarella cheese. Add a layer of the remaining eggplant slices and top with the remaining sauce, mozzarella and Parmesan. Bake, uncovered, until the sauce bubbles and the top is golden, 15 to 20 minutes. Some of these suggestions I got from Eating Well and their healthy eggplant parm recipe. I like to make little ‘tweaks’ when I’m cooking. It always makes it better and I can customize it to my families’ taste! Happy Eating!